The brand new Baku Aquatics Centre will be home to swimming, diving and synchronised swimming during the 2015 European Games. Able to seat 6,000, and with more than 800 athletes expected to grace the centre’s swimming pools across the 14-days of competition, the Aquatics Centre will be one of the most popular venues at the Games. This venue will leave a lasting legacy for the people of Baku. It is the first purpose-built aquatics centre in Azerbaijan and will open to the public following the Games – a first for the country. The Athletes’ Village will be a “home away from home” for competitors at the Games. The Village comprises 13 buildings, 1,042 apartments, 16 different types of apartments, with three to four bedrooms per apartment, and a total of 7,510 beds. Extensive experience gained through Azerbaijan’s participation in five Summer and four Winter Olympics during its 24 years of independence has allowed organisers to design a state-of-the-art facility that will provide a secure, comfortable, friendly and stress-free environment for those competing at Baku 2015. 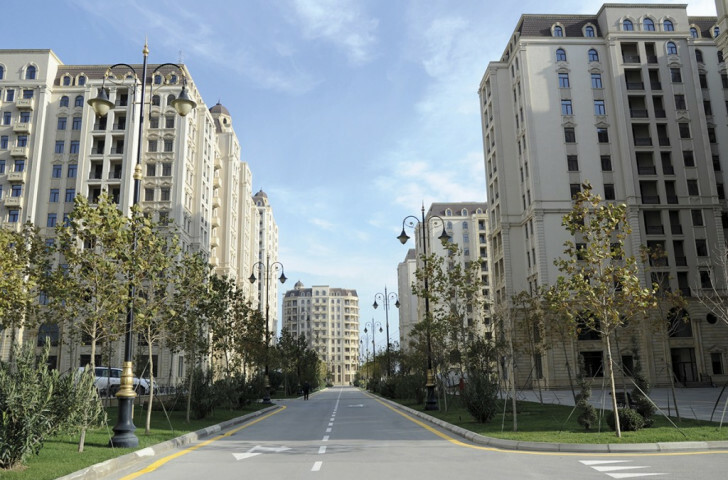 The apartments will be sold to local Baku citizens after the Games. The BMX Velopark is located south of Flag Square and the European Games Park, opposite the Ramada Hotel and Waterpark. The Velopark is a temporary venue built for Baku 2015, although the BMX Track itself will remain post Games for use by the public as part of the Games Legacy. The facility has the ability to hold nearly 1,000 spectators on each competition day, giving the best views in the house for those wanting to watch this fast-paced, exciting and comparatively new sport. 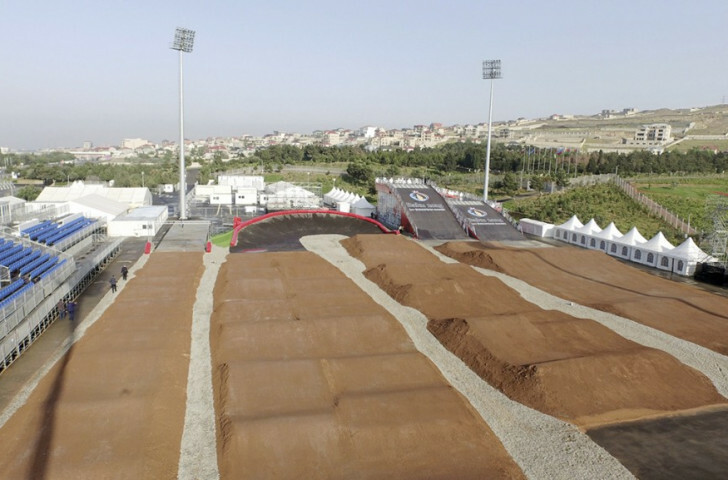 A temporary facility built specifically for the European Games, the Mountain Bike Velopark is located in the hills immediately south of the Baku Shooting Centre, and is the first ever purpose built mountain bike course in Azerbaijan. Open for just a single day at Baku 2015, the venue has capacity for 1,670 spectators and more than 75 athletes will compete in the competition. It was completed in October 2014, ready for the test event which was held there on October 18 and 19. 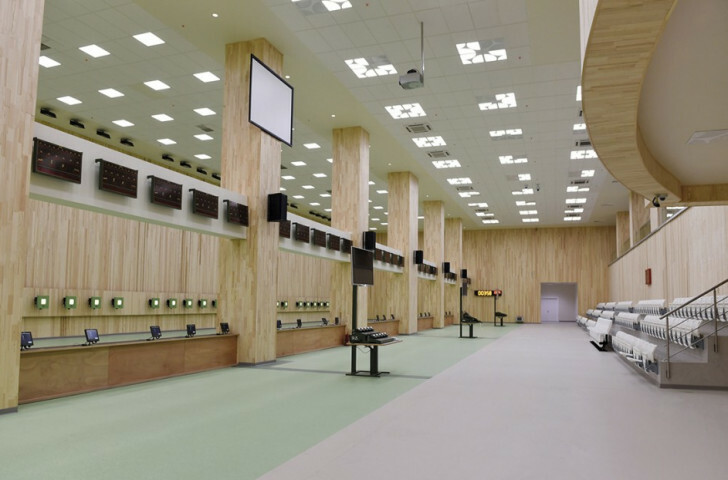 The Baku Shooting Centre is a brand-new purpose built shooting facility for the European Games. The new facility is located a 30-minute drive west of Baku and the closest public transport hub is the City Bus Terminal, Moskva Prospekti which is approximately 100 metres away from the venue. The venue will host the seven-day shooting competition bringing with it 330 athletes who will be battling for the 19 gold medals on offer. 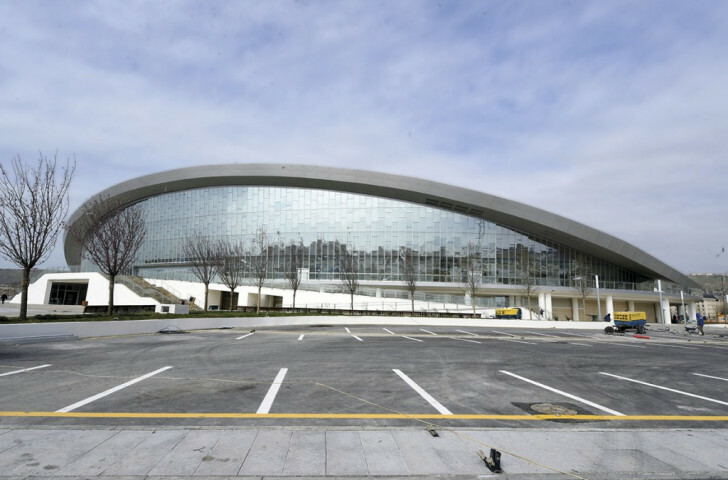 The Baku Sports Hall will be the home of racquet sports as Europe’s best badminton and table tennis stars compete for prestigious European crowns. 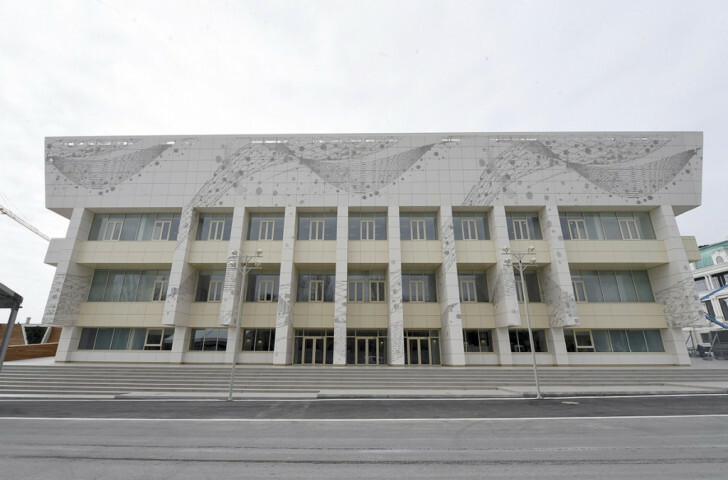 Located on the Baku Boulevard, inside the City Cluster, the Sports Hall has been fully-renovated for the Games. The 900-seater stadium will host the table tennis contest from June 13 until 19 before housing the badminton competition between June 22 and 29. Almost 300 athletes will compete at the venue across the two sports, with 128 entered for table tennis and 160 for badminton. The facility was previously a volleyball centre and is expected to host basketball, handball and volleyball after Baku 2015. Fast, frantic and full of energy will be the recipe for success at Baku’s Basketball Arena as it plays host to the highly energetic 3x3 basketball. 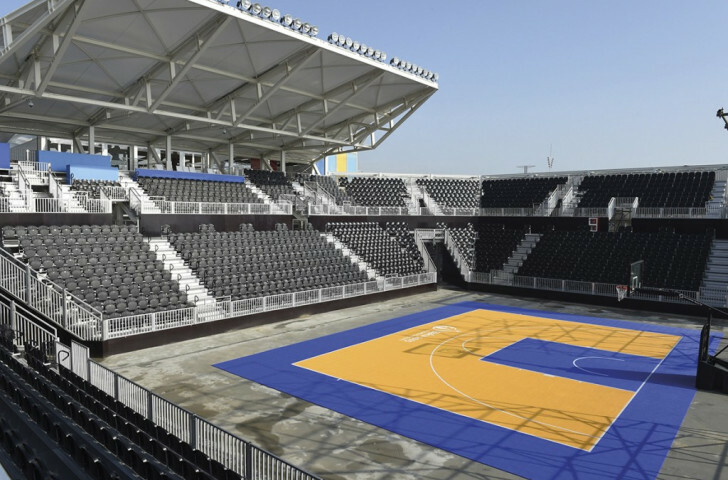 It will be home to 128 athletes as they vie for a place in European history, with more than 1,800 fans clamouring to see their favourite basketball stars in action, each day. Azerbaijan’s beautiful coast makes it the ideal setting for beach sport. Add in a stunning Beach Arena and fans will be jumping at the opportunity to watch some of the most popular sports. This 1,500-seater temporary venue joins some of the most popular facilities inside the European Games Park, and is sure to give the fans exactly what they are looking for. Hosting both beach soccer and beach volleyball, the venue is the perfect facility for fans to sit back, relax and enjoy Europe’s elite beach stars compete for their respective coveted European titles. The Bilgah Beach competition venue is located off the Zagulba Highway, north of Amburan Beach Club, approximately 30-minutes drive from Baku. This temporary venue will host triathlon and cycling time trial events. 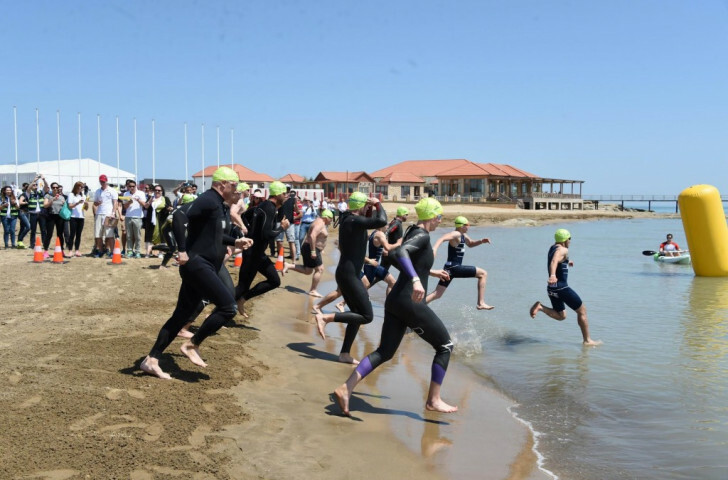 Earlier this year it staged Azerbaijan’s first-ever triathlon. Baku’s iconic Crystal Hall will be a showcase venue for the European Games. The arena was originally planned to be just a temporary facility, but was altered during construction to enable it to remain in place for longer. 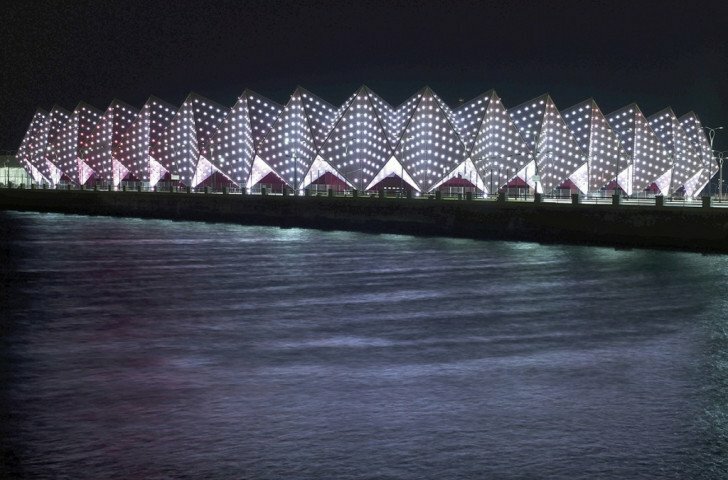 The characteristic crystalline shape of the building and its illuminated façade is the response to Azerbaijan’s special request for the creation of a widely visible and visually effective landmark as a bridge between Asia and Europe that will be noticed in an international context. Different dynamic lighting scenarios have been programmed for the 9,500 LED lights to highlight the membrane façade and create moods appropriate for the different stages of the events. During Baku 2015 the Crystal Hall will be the home of indoor volleyball, fencing, taekwondo, boxing and karate. With a capacity of 25,000, the venue is the third largest venue at the European Games. 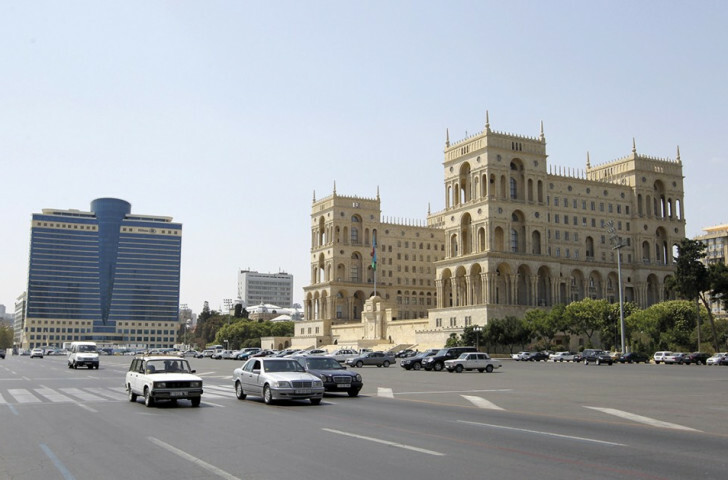 Located in front of Government House and running parallel to the Baku Boulevard, Freedom Square was renamed following the collapse of the Soviet Union in 1991. The venue for the start and finish of the cycling road races, the competition will take place along a city-wide route. The race route consists of a 13.5 kilometres circuit, which will include the Old City. The Heydar Aliyev Sports and Exhibition Complex will be home to judo, sambo and wrestling during the 2015 European Games. Named after former President of Azerbaijan, Heydar Aliyev, the Arena was completed in 1989. With a diameter of 122 metres, the dome of the building is supported by steel crossed guy ropes with no vertical supports and stiff trusses. After renovation, the Complex was used as the nation’s Gymnastics Centre. 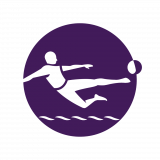 Between 2007 and 2009 all national training, as well as two European Championships, a World Cup and a World Gymnastics Championships were held there. Throughout 2014, the Arena was under reconstruction again for the European Games. The finishing of the 7,500-seat auditorium was done afresh, with new, comfortable seating. The lighting of the Arena was completely replaced, with huge screens installed and a new acoustic system developed. The Arena is located in the City Cluster on Tbilisi Avenue and is a 20-minute journey from the Athletes’ Village. Mingachevir is the only venue located outside of Baku, sitting approximately five hours drive from the Azerbaijani capital. 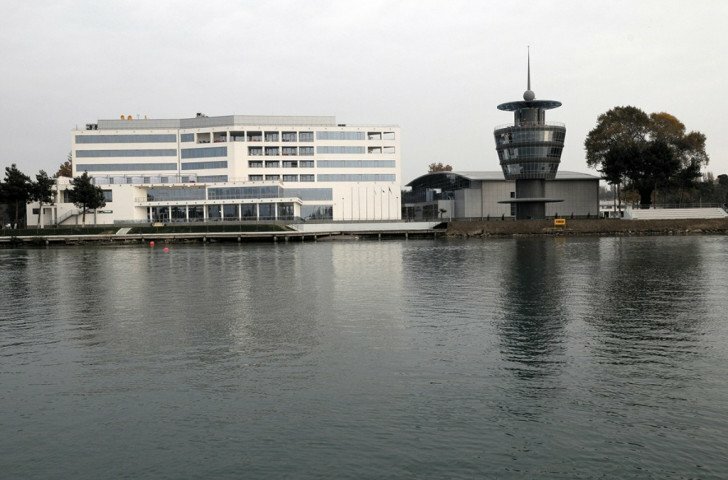 The city is home to the Azerbaijan canoe sprint and rowing teams, who train at the Kur Sport and Rowing Centre, the national Olympic training centre. Located on the picturesque banks of the Kur River, the centre will host three-days of canoe sprint action during the Games. Re-opened on October 4 2010, by Azerbaijan President Ilham Aliyev, the centre is one of the best in the world for water sports. Its state-of-the-art equipment and facilities attract some of the world’s top athletes year-round as they train for some of the most prestigious Championships on the sporting calendar. During Baku 2015 the venue will welcome more than 350 of Europe’s best paddlers as they compete for the 15 medals up for grabs. The venue will hold a capacity of 1,300 spectators on days of competition. Baku boasts one of the few bespoke gymnastics arenas in the world thanks to the support of Azerbaijan’s First Lady Mehriban Aliyeva. 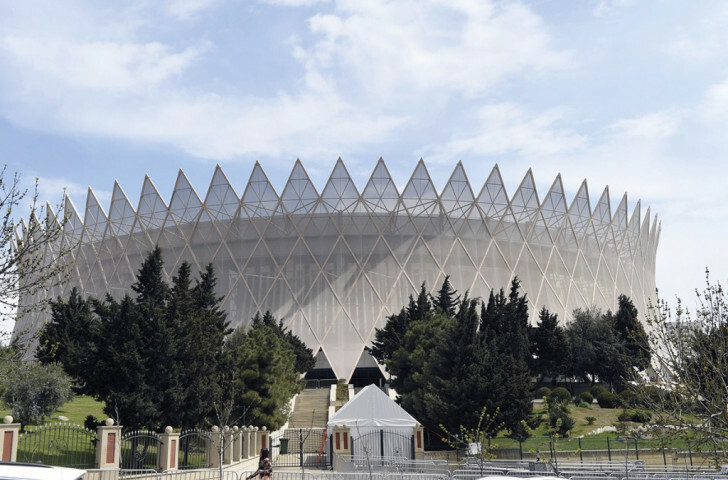 Officially opened in April 2014 by President Ilham Aliyev and the First Lady, who is also the head of Azerbaijan’s Gymnastics Federation, the National Gymnastics Arena will be a centrepiece venue for the European Games. The iconic Arena will play host to all five gymnastic disciplines being held at the Games - artistic, rhythmic, acrobatic, aerobic and trampoline. It will sit within the Village Cluster, positioned just a mile away from both the Athletes’ Village and main Olympic Stadium. Broadway Malyan’s approach was to prioritise the spectators’ experience and gymnasts’ needs. They also addressed the challenges of venue design, combining an intelligence-led design approach, with an understanding of the intangibles - such as “atmosphere” - that make venues successful. The resultant design symbolises Azerbaijan’s strong gymnastics heritage and takes inspiration from the ribbon of the rhythmic gymnast, featuring three ribbon louvres to control daylight and solar gain and create views. 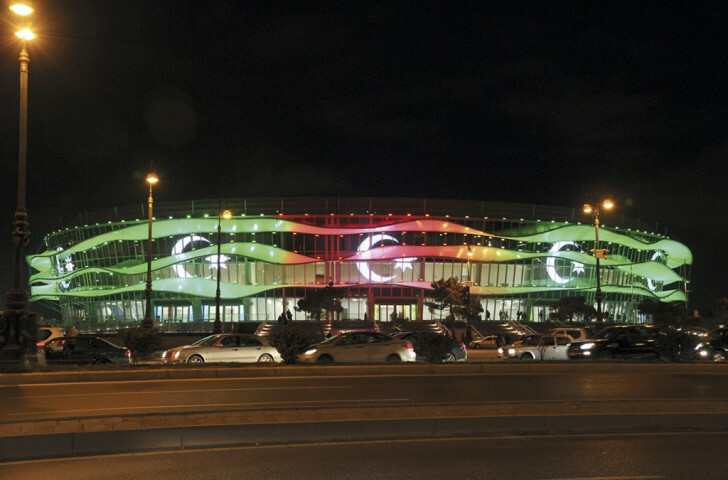 At night dynamic lighting will make the arena appear as three ribbons in Azerbaijan’s national colours ﬂuttering over a stone plinth, with the lighting scheme also enabling the projection of lighting displays and dynamic imagery. an underground car park capable of parking at least 300 vehicles. As the centre piece for the 2015 European Games, the Baku Olympic Stadium will become a global icon for sporting stadia across the world. Designed to host football matches and athletic meets, the Stadium, which has a capacity of 68,000, is located just to the north of the Athletes’ Village. 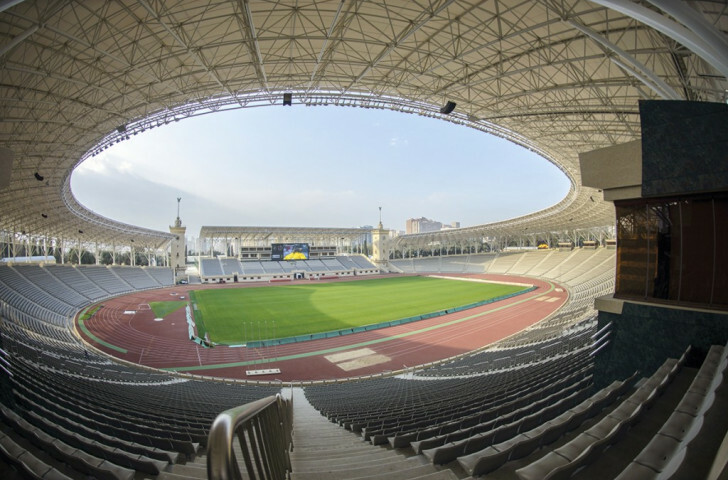 After the European Games, the venue will host matches for the Azerbaijan national football team as well as concerts. It has been chosen as one of the venues by UEFA for EURO 2020 and will stage group stage matches, as well as a quarter-final. Predominantly used for football matches, the Stadium is the home of the Azerbaijani national team and Qarabağ Futbol Klubu, the reigning champions in the Azerbaijan Premier League, which is the top flight of football within the nation. It is also the venue of choice for any Azerbaijani club that reaches the latter stages of European competitions. 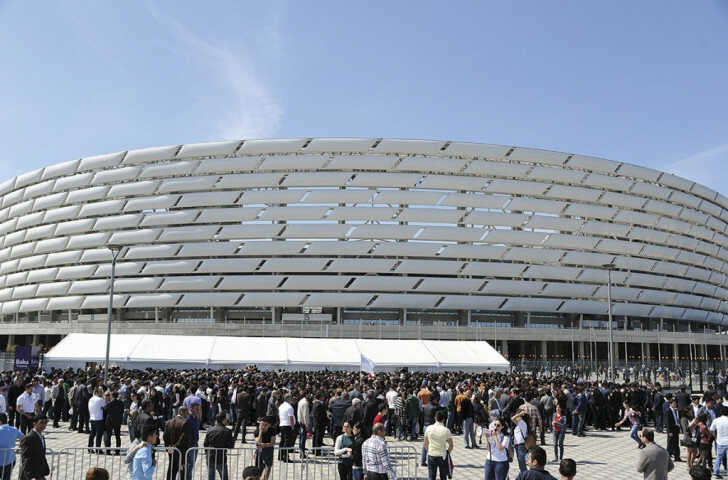 With a capacity of 31,200, it used to be the largest Stadium in the country, until the completion of the Baku Olympic Stadium earlier this year. It was renamed in 1993 following the death of famous Azerbaijani official Tofiq Bahramov, better known as “the Russian linesman” in England. His career was most noted for his decision to award England a controversial goal in the 1966 World Cup final against West Germany. During Baku 2015, the Stadium will host archery and have a capacity of 1,200 at Games time. 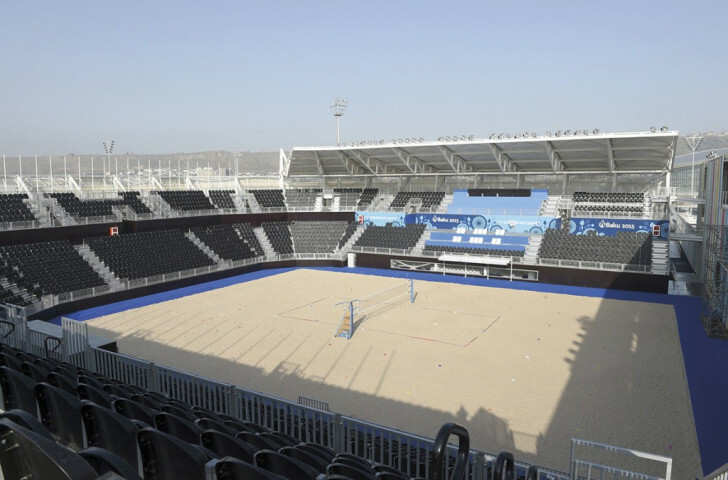 Based in the state-of-the art European Games Park, the Water Polo Arena is a temporary facility erected for the Games. The venue has the capacity to seat more than 1,200 spectators as they cheer on the best water polo players from across the continent. 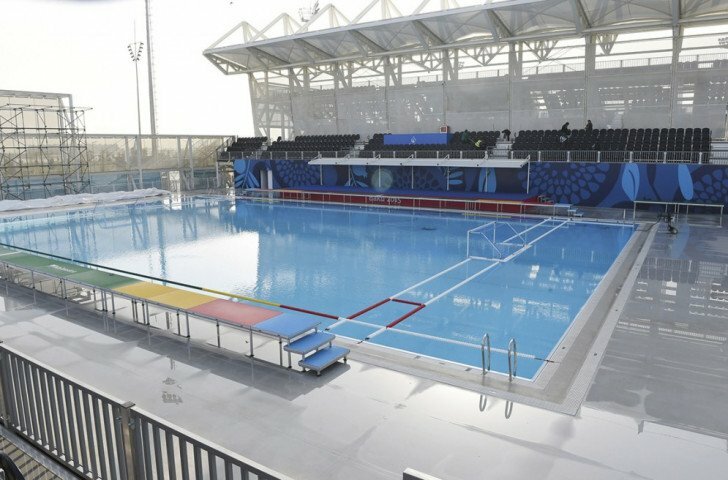 Two pools have been constructed in order to host the 10-days of water polo action.